For my kitchen upgrade I’ve decided to upgrade the drawer slides to “Soft Close”. It turns out that it’s harder to find soft close that will work with older drawers. I found mine made in the USA by Knape and Vogt. I selected model 8419 so that they provide full extension with “Over Travel” so that the drawer will extend beyond the new counter top. Have a look on the Knape and Vogt website. I’ve received 5 of the 8 slides that I need and installed them on the drawers and the cabinets. 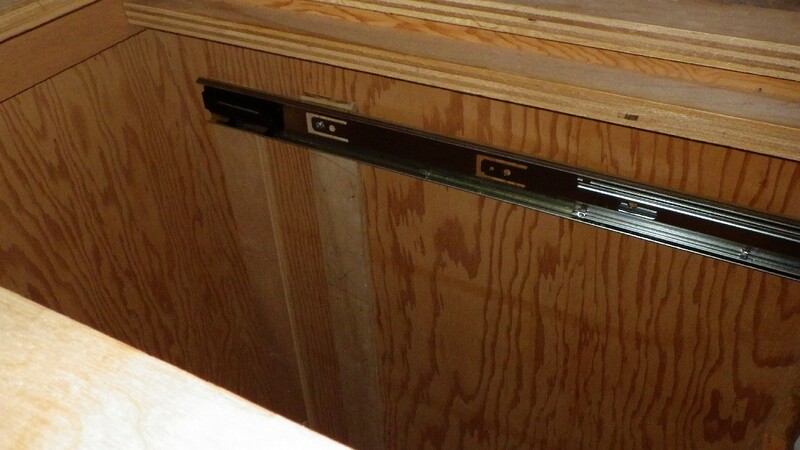 To install the slides, I placed strips of 1/8″ door skin under the drawer box, then marked for the holes to attach the slides with the slide pushed up against the drawer. This will raise the drawer box 1/8″ above the base of the slide. Then I pulled the slide apart and mounted the drawer part with #6 1/2″ screws to the box. The cabinet part of the slide is mounted flush with the bottom of the face frame opening. 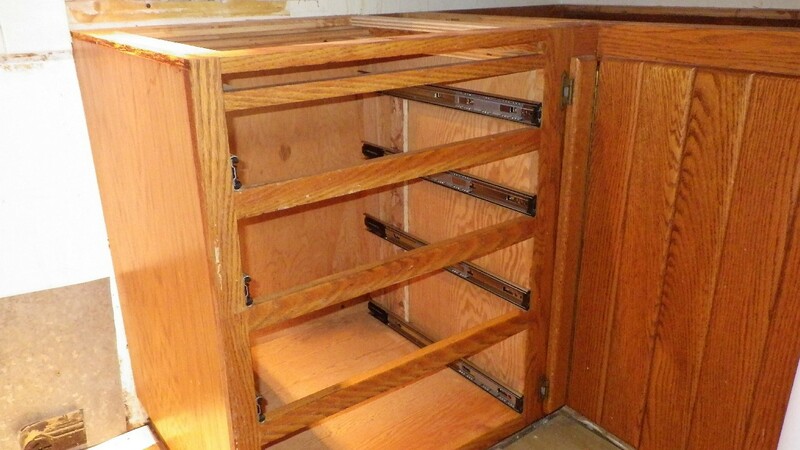 The old drawer slides were attached to mounting strips stapled into the cabinet. But the soft close mechanism moves the mounting holes forward, so I needed to staple new mounting strips to the cabinet that would line up with the mounting holes in the new slides. 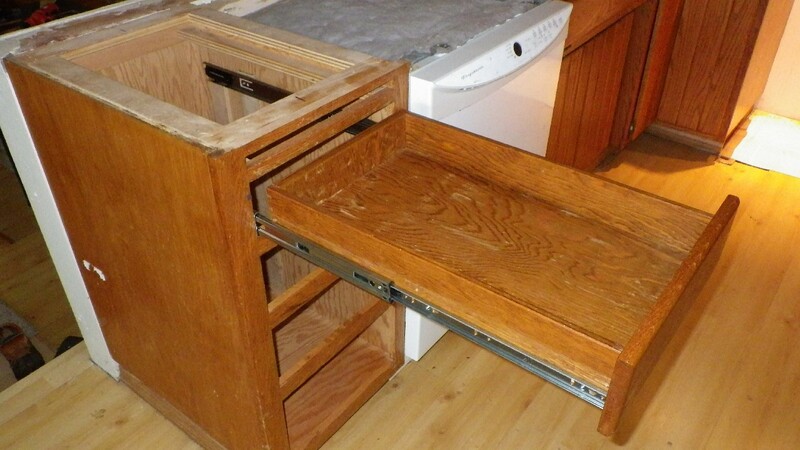 This photo shows a drawer mounted with the new slides and fully extended. The model of slide I chose, the 8419 has “Over Travel” which means that the drawer extends about 2 inches beyond the front of the cabinet. This means that the back of the drawer is easily accessible when the drawer is pulled out even when the counter top extends beyond the cabinet face. Modern cabinet drawer design uses slides that are below the drawer rather than on the sides. This means that the slides are not visible when the drawer is extended, but the drawer is about 1/2″ shallower as a result. This is normally not a problem since modern cabinets are often designed without face frames and without these frames, the drawers can be deeper. The K and V slides are the only slides I have found for traditional drawer boxes that also have “Soft Close”. These slides pull the drawer shut as it approaches the closed position. When the drawer reaches about 2″ from the cabinet face, the closing mechanism pulls the drawer closed. I would not call these slides true “Soft Close” since the drawers do tend to bang closed, and you may want to consider adding some thin felt bumpers to the cabinet face to keep the drawers from banging closed. At $17 each for the 22″ length, these K & V slides are high quality and very affordable.